A falling body accelerates uniformly: it picks up equal amounts of speed in equal time intervals, so that, if it falls from rest, it is moving twice as fast after two seconds as it was moving after one second, and moving three times as fast after three seconds as it was after one second. We also found, from the experiment, that a falling body will fall four times as far in twice the time. That is to say, we found that the time to roll one-quarter of the way down the ramp was one-half the time to roll all the way down. To get a clear idea of what’s happening, you should sketch a graph of how speed increases with time. This is a straight line graph, beginning at zero speed at zero time, then going through a point corresponding to two meters per second at time one second, four at two seconds and so on. It sounds trivial, but is surprisingly helpful to have this graph in front of you as you read—so, find a piece of paper or an old envelope (this doesn’t have to be too precise) and draw a line along the bottom marked 0, 1, 2, for seconds of time, then a vertical line (or y-axis) indicating speed at a given time—this could be marked 0, 2, 4, … meters per second. Now, put in the points (0,0), (1,2) and so on, and join them with a line. From your graph, you can now read off its speed not just at 0, 1, 2 seconds, but at, say 1.5 seconds or 1.9 seconds or any other time within the time interval covered by the graph. The hard part, though, is figuring out how far it moves in a given time. This is the core of Galileo’s argument, and it is essential that you understand it before going further, so read the next paragraphs slowly and carefully! Let us ask a specific question: how far does it get in two seconds? If it were moving at a steady speed of four meters per second for two seconds, it would of course move eight meters. But it can’t have gotten that far after two seconds, because it just attained the speed of four meters per second when the time reached two seconds, so it was going at slower speeds up to that point. In fact, at the very beginning, it was moving very slowly. Clearly, to figure out how far it travels during that first two seconds what we must do is to find its average speed during that period. This is where the assumption of uniform acceleration comes in. What it means is that the speed starts from zero at the beginning of the period, increases at a constant rate, is two meters per second after one second (half way through the period) and four meters per second after two seconds, that is, at the end of the period we are considering. Notice that the speed is one meter per second after half a second, and three meters per second after one-and-a-half seconds. From the graph you should have drawn above of the speed as it varies in time, it should be evident that, for this uniformly accelerated motion, the average speed over this two second interval is the speed reached at half-time, that is, two meters per second. Now, the distance covered in any time interval is equal to the average speed multiplied by the time taken, so the distance traveled in two seconds is four meters—that is, two meters per second for two seconds. Now let us use the same argument to figure how far the ball rolls in just one second. At the end of one second, it is moving at two meters per second. At the beginning of the second, it was at rest. At the half-second point, the ball was moving at one meter per second. By the same arguments as used above, then, the average speed during the first second was one meter per second. Therefore, the total distance rolled during the first second is just one meter. We can see from the above why, in uniform acceleration, the ball rolls four times as far when the time interval doubles. If the average speed were the same for the two second period as for the one second period, the distance covered would double since the ball rolls for twice as long a time. But since the speed is steadily increasing, the average speed also doubles. It is the combination of these two factors—moving at twice the average speed for twice the time—that gives the factor of four in distance covered! It is not too difficult to show using these same arguments that the distances covered in 1, 2, 3, 4, ...seconds are proportional to 1, 4, 9, 16, .., that is, the squares of the times involved. This is left as an exercise for the reader. In fact, using a video camera, we can check the hypothesis of uniform acceleration very directly on a falling object. We drop the ball beside a meter stick with black and white stripes each ten centimeters wide, so that on viewing the movie frame by frame, we can estimate where the ball is at each frame. Furthermore, the camera has a built-in clock—it films at thirty frames per second. Therefore, we can constantly monitor the speed by measuring how many centimeters the ball drops from one frame to the next. Since this measures distance traveled in one-thirtieth of a second, we must multiply the distance dropped between frames by thirty to get the (average) speed in that short time interval in centimeters per second. By systematically going through all the frames showing the ball falling, and finding the (average) speed for each time interval, we were able to draw a graph of speed against time. It was a little rough, a result of our crude measuring of distance, but it was clear that speed was increasing with time at a steady rate, and in fact we could measure the rate by finding the speed reached after, say half a second. We found that, approximately, the rate of increase of speed was ten meters (1,000 cms) per second in each second of fall, so after half a second it was moving at about five meters per second, and after a quarter of a second it was going two and a half meters per second. This rate of increase of speed is the same for all falling bodies, neglecting the effect of air resistance (and buoyancy for extremely light bodies such as balloons). It is called the acceleration due to gravity, written g, and is actually close to 9.8 meters per second per second. However, we shall take it to be 10 for convenience. To clarify ideas on the acceleration due to gravity, it is worth thinking about throwing a ball vertically upwards. If we made another movie, we would find that the motion going upwards is like a mirror image of that on the way down—the distances traveled between frames on the way up get shorter and shorter. In fact, the ball on its way up loses speed at a steady rate, and the rate turns out to be ten meters per second per second—the same as the rate of increase on the way down. For example, if we throw the ball straight upwards at 20 meters per second (about 45 mph) after one second it will have slowed to 10 meters per second, and after two seconds it will be at rest momentarily before beginning to come down. After a total of four seconds, it will be back where it started. An obvious question so: how high did it go? The way to approach this is to find its average speed on the way up and multiply it by the time taken to get up. As before, it is helpful to sketch a graph of how the speed is varying with time. The speed at the initial time is 20 meters per second, at one second it’s down to 10, then at two seconds it’s zero. It is clear from the graph that the average speed on the way up is 10 meters per second, and since it takes two seconds to get up, the total distance traveled must be 20 meters. Let us now try to extend our speed plot to keep a record of the entire fall. The speed drops to zero when the ball reaches the top, then begins to increase again. We could represent this by a V-shaped curve, but it turns out to be more natural to introduce the idea of velocity. Unfortunately velocity and speed mean the same thing in ordinary usage, but in science velocity means more: it includes speed and direction. Our convention: velocity upwards is positive, downwards is negative. If we plot the velocity of the ball at successive times, it is +20 initially, +10 after one second, 0 after two seconds, -10 after three seconds, -20 after four seconds. If you plot this on a graph you will see that it is all on the same straight line. Over each one-second interval, the velocity decreases by ten meters per second throughout the flight. In other words, the acceleration due to gravity is -10 meters per second per second, or you could say it is 10 meters per second per second downwards. What’s the Acceleration at the Topmost Point? Most people on being asked that for the first time say zero. That’s wrong. But to see why takes some very clear thinking about just what is meant by velocity and acceleration. Recall Zeno claimed motion was impossible because at each instant of time an object has to be in a particular position, and since an interval of time is made up of instants, it could never move. The catch is that a second of time cannot be built up of instants. It can, however, be built up of intervals of time each as short as you wish. Average velocity over an interval of time is defined by dividing the distance moved in that interval by the time taken—the length of the interval. We define velocity at an instant of time, such as the velocity of the ball when the time is one second, by taking a small time interval which includes the time one second, finding the average velocity over that time interval, then repeating the process with smaller and smaller time intervals to home in on the answer. Now, to find acceleration at an instant of time we have to go through the same process. Remember, acceleration is rate of change of velocity. This means that acceleration, too, can be positive or negative! You might think negative acceleration is just slowing down, but it could also mean speeding up in the direction you’ve chosen for velocity to be negative—so, be careful! To find the acceleration at an instant we have to take some short but non-zero time interval that includes the point in question and find how much the velocity changes during that time interval. Then we divide that velocity change by the time it took to find the acceleration, in, say, meters per second per second. The point is that at the topmost point of the throw, the ball does come to rest for an instant. Before and after that instant, there is a brief period where the velocity is so small it looks as if the ball is at rest. Also, our eyes tend to lock on the ball, so there is an illusion that the ball has zero velocity for a short but non-zero period of time. But this isn’t the case. The ball’s velocity is always changing. To find its acceleration at the topmost point, we have to find how its velocity changes in a short time interval which includes that point. If we took, for example, a period of one-thousandth of a second, we would find the velocity to have changed by one centimeter per second. So the ball would fall one two-thousandth of a centimeter during that first thousandth of a second from rest-not too easy to see! The bottom line, though, is that the acceleration of the ball is 10 meters per second per second downwards throughout the flight. If you still find yourself thinking it’s got no acceleration at the top, maybe you’re confusing velocity with acceleration. All these words are used rather loosely in everyday life, but we are forced to give them precise meanings to discuss motion unambiguously. In fact, lack of clarity of definitions like this delayed understanding of these things for centuries. We follow fairly closely here the discussion of Galileo in Two New Sciences, Fourth Day, from page 244 to the middle of page 257. (i) Naturally accelerated vertical motion, which is the motion of a vertically falling body that we have already discussed in detail. (ii) Uniform horizontal motion, which he defines as straight-line horizontal motion which covers equal distances in equal times. This simple statement is in itself a substantial advance on Aristotle, who thought that an inanimate object could only continue to move as long as it was being pushed. Galileo realized the crucial role played by friction: if there is no friction, he asserted, the motion will continue indefinitely. Aristotle’s problem in this was that he observed friction-dominated systems, like oxcarts, where motion stopped almost immediately when the ox stopped pulling. Recall that Galileo, in the rolling a ball down a ramp experiment, went to great pains to get the ramp very smooth, the ball very round, hard and polished. He knew that only in this way could he get reliable, reproducible results. At the same time, it must have been evident to him that if the ramp were to be laid flat, the ball would roll from one end to the other, after an initial push, with very little loss of speed. Galileo introduces projectile motion by imagining that a ball, rolling in uniform horizontal motion across a smooth tabletop, flies off the edge of the table. He asserts that when this happens, the particle’s horizontal motion will continue at the same uniform rate, but, in addition, it will acquire a downward vertical motion identical to that of any falling body. He refers to this as a compound motion. The simplest way to see what is going on is to study Galileo’s diagram on page 249, which we reproduce here. Imagine the ball to have been rolling across a tabletop moving to the left, passing the point a and then going off the edge at the point b. Galileo’s figure shows its subsequent position at three equal time intervals, say, 0.1 seconds, 0.2 seconds and 0.3 seconds after leaving the table, when it will be at i, f, and h respectively. The first point to notice is that the horizontal distance it has travelled from the table increases uniformly with time: bd is just twice bc, and so on. That is to say, its horizontal motion is just the same as if it had stayed on the table. The ratio of the vertical distances dropped in two different times, for example bg/bo, is always the square of the ratio of the horizontal distances travelled in those times, in this case fg/io. You can easily check that this is always true, from the rule of uniform acceleration of a falling body. For example, bl is nine times bo, and hl is three times io. Galileo proved, with a virtuoso display of Greek geometry, that the fact that the vertical drop was proportional to the square of the horizontal distance meant that the trajectory was a parabola. His definition of a parabola, the classic Greek definition, was that it was the intersection of a cone with a plane parallel to one side of the cone. Starting from this definition of a parabola, it takes quite a lot of work to establish that the trajectory is parabolic. 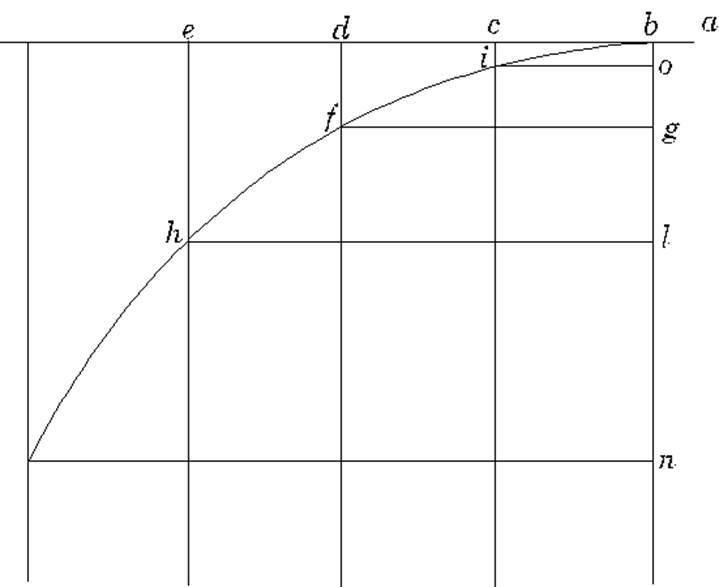 However, if we define a parabola as a curve of the form y = Cx² then of course we’ve proved it already!